Organization. What emotion does that word bring up in you? I am tend to fall into the happy emotions when it comes to organizing. Because I recognize that end result will benefit me. I have found that is the case with how I have organized my kitchen. To me there is nothing more frustrating than not being able to find something or having it take too long to retrieve. If I am doing a lot in the kitchen I want to be able to find what I need at lightning speed. What I also find frustrating is wasting money on ingredients because I didn’t realize I still had some in the house. Even worse when its food wasted in the fridge that I have to throw out. 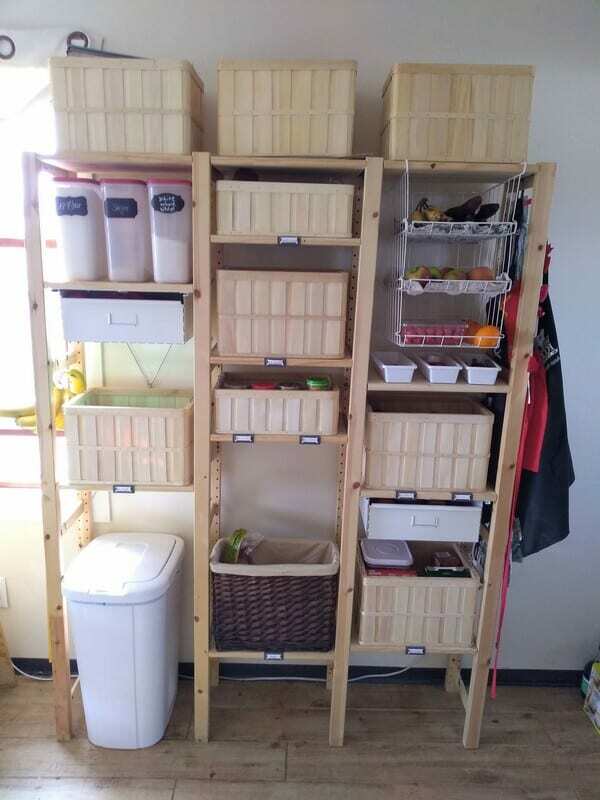 Today I decided I wanted to give you a little insight into how we are organize our kitchen at Eat Like No One Else HQ. We have been at our current house since the end of October 2018. Kitchen organization is still a work in progress. I will share more as I complete different “projects”. Let’s see what I have done so far. The Rubbermaid Modular Canisters (with red lids) fit perfectly in this cabinet. The space is used really well, nothing is wasted. The canisters fit perfectly on top of another. In some columns you see canisters that take up the whole shelf. Some I can fit 1 small canister and 1 medium canister. Some I fit 3 small canisters. About a year and a half ago I made a discovery that would change the way I function in my kitchen. 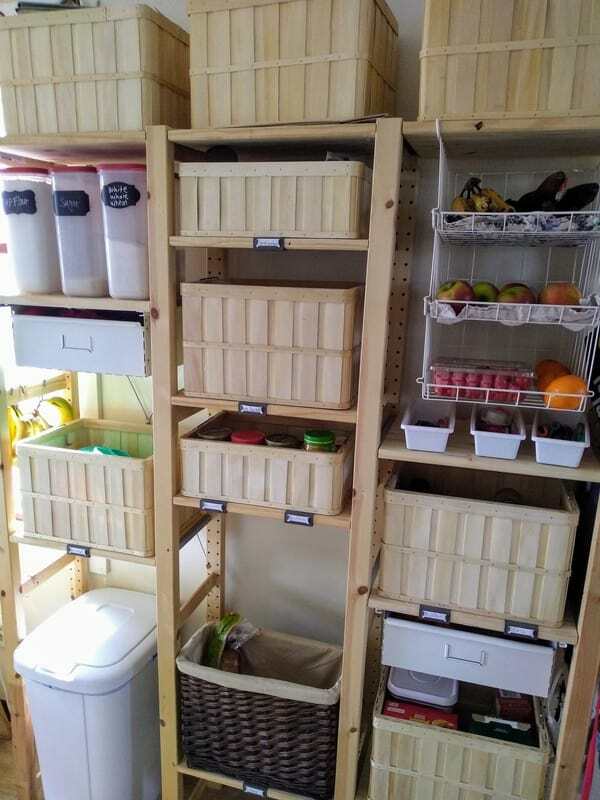 For years I had been struggling with keeping all my dried goods (flours, pasta, cocoa powder, sugar, salt, etc) organized. The biggest issue is that the packages that all these items come in are very different in size and shape, making it hard to organize. I did have containers for the flour and sugar, but even those weren’t matching up. What changed everything is when I discovered Rubbermaid Modular Canisters. The original attraction to these containers is that they are nearly the perfect length of the shelves in my cabinets. That means they would fit in perfectly without any room behind for stuff to fall and get lost. What else I like about the Rubbermaid Modular Canisters is that they are modular and fit well together. Depending on the size of the shelf you can change around how many containers fit by picking different sizes. It makes customization really easy. To label my bins I use chalk board stickers and chalk board markers. You can wipe off the marker with a damp towel. I love being able to change the labels as I change what I have on hand. I keep a few extra canisters of different sizes in the back in case I need to re-organize. When I moved to my new house, the canisters fit my new cabinet shelves just as the old ones. The tallest canisters didn’t fit in the cabinets like they did at my old house, but I still found use for them one different kitchen shelving. The Rubbermaid Modular Canisters make shopping easier. Since the canisters are see through I can easily see what I am almost out of or am completely out of. And on the other end prevents overbuying. 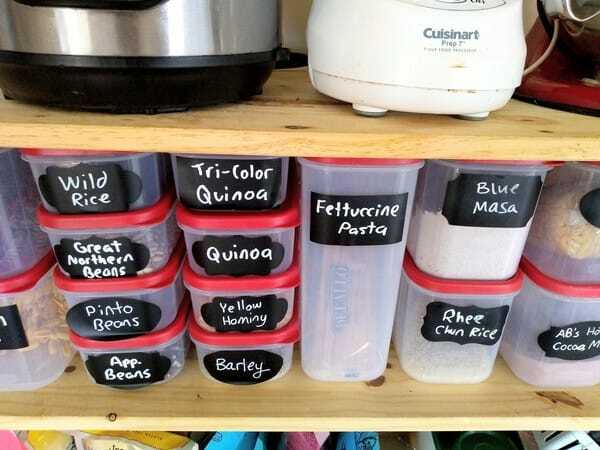 To label my bins – I use chalk board stickers and chalk board markers. It’s key to have marked areas for each item in your spice cabinet, that way there is no doubt where something goes and it’s easy to check if you are out of something. 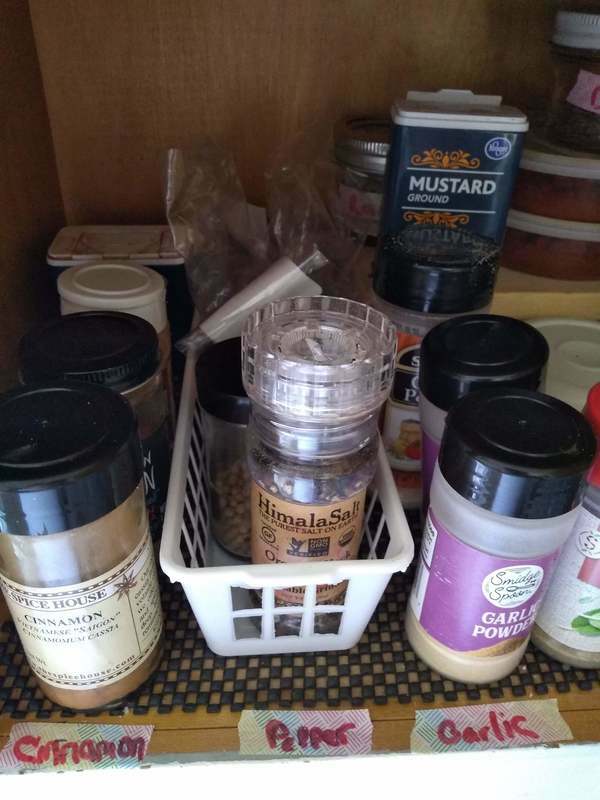 One of the areas I think people struggle the most with kitchen organization is spices. It’s hard to keep all those containers organized. You could buy a whole bunch of jars to keep all our spices in. That isn’t a bad idea if you got the money to spend, go for it. Then when you buy spices in containers just remove them to your jars. 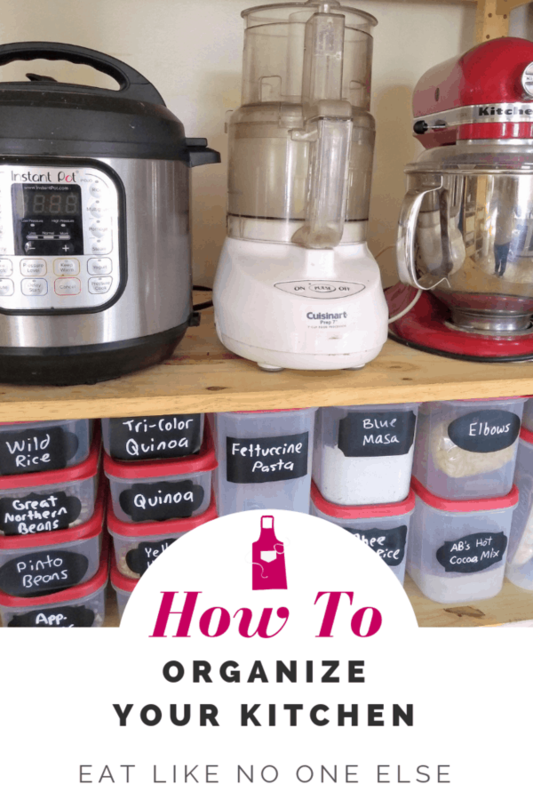 Let me show you how I organize my spices with containers of all sizes and shapes. The key thing is to make sections. I keep all the salt in one section. Peppercorns has a section. Garlic powder has a section. Any spice that you use all the time, should have it’s own section. Spices that I don’t use very often can just be in a section called spices. I like to separate my spices and my dried herbs as well. I bought that white container that to create a cheap and simple divide. 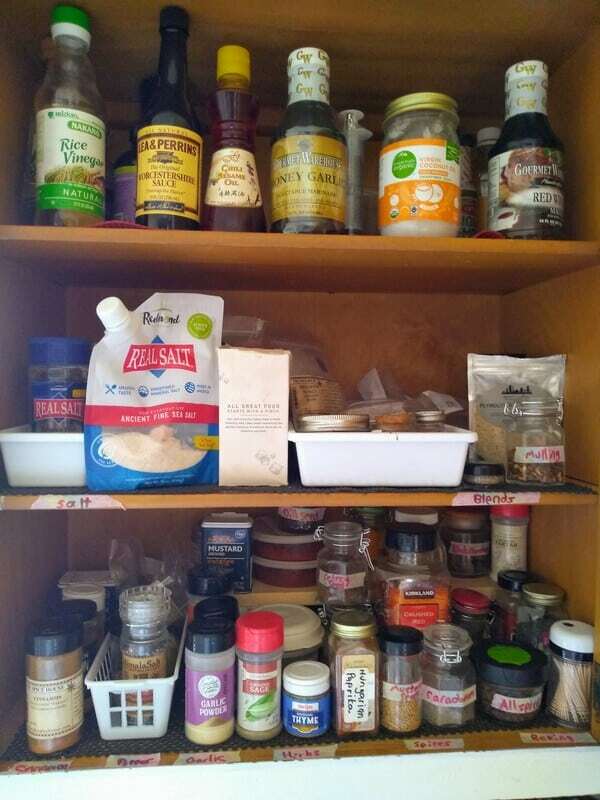 I recommend creating different sections for spices that I use for savory dishes and spices I use mainly for baking. Cinnamon is a popular spice, so it gets it’s own section as seen in the photo above. To raise the spices in the back up so I can see them. Prevent a bunch of spices from getting lost in back. Spices are best when keep in the dark, so having a spice rack out in the opening isn’t the best idea. The spice rack is more useful in my cabinet. We actually also use them next to the kids’ beds for them to put their water bottles and a couple books. For labeling my shelf I use washi tape or masking tape that I write on with a Sharpie marker. In order to keep things clean and organize. In our previous house, this unit was 2 separate 1-section shelving units located in two different rooms. When we moved we just combined the two units making a three section unit. All we needed to do was get more shelves and I was ready to go. In the house I live in now I do not have an actual pantry. What I do have is extra space in the kitchen next to one of the windows as well as next to the fridge. Here is what I did with those spaces. I turned to IKEA for these pine colored shelving units. It’s called their IVAR system. What I love about is that I can easily customize (there is that word again) the shelves to the height I want. All of the wooden baskets are from IKEA. I have one for baby stuff, peanut butter & chocolates, crackers, canned goods and stocks, bagged snacks, dried fruit and nuts, baking pans, and reusable bags. The dark brown basket is used to store bread. It’s tall so that you can fit a baguette in it. The white metal drawers you see is where we store our fruit. I prefer to put perishable produce in these metal bins in case something goes soft or rots, I can easily clean the metal container with soap and water. As I said earlier this is only the start of our organization. I will be including more projects in the future. So stay tuned! 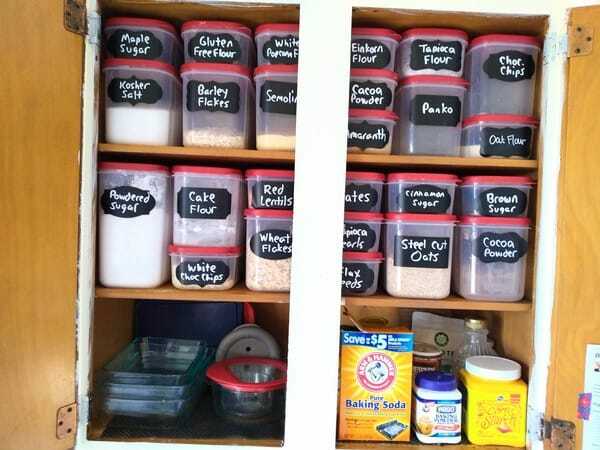 What do you use to organize your kitchen? Share with us your favorite organization tools. Leave a comment below. Previous Post: « What Does Avocado Honey Taste Like?